Count your blessings. 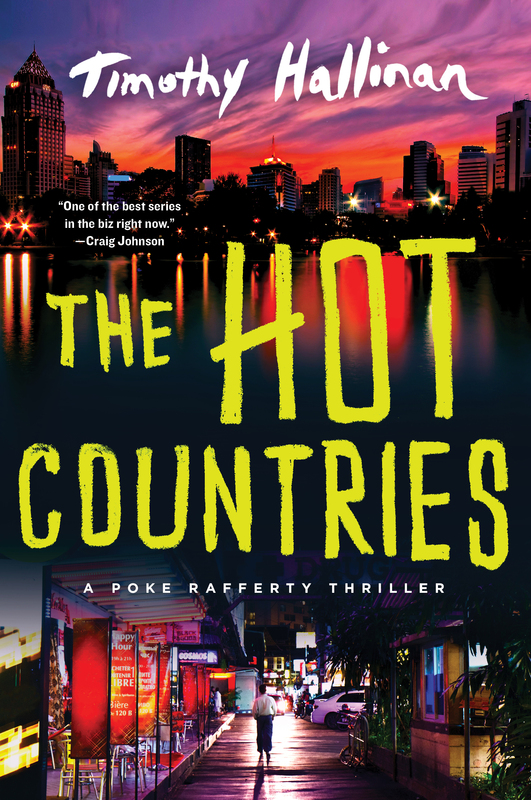 That’s my best summation of The Hot Countries by Timothy Hallinan – the 7th in the Poke Rafferty series. Recognize them, count them, hold onto them, and appreciate them before it’s too late or worse yet, before you die. Poke Rafferty is a tougher than usual travel writer who is also a family man capable of crying during a television commercial designed to jerk tears or when his daughter performs brilliantly in a school play production. He is part of a diverse expat community living in Bangkok, Thailand. By choice many of his friends are aging longtime expats, holdovers from the Vietnam War era. Hallinan is a gifted writer and one of those rare authors capable of putting out two novels per year for two separate and successful series. The other being his Junior Bender series set in Southern California. Both series have drawn the attention of a number of the more prestigious book awards as any mantel or bookshelf in his home could surely prove. There was a time when you would see A BANGKOK THRILLER stamped on this series of books but that is no longer the case. In its place you now see A POKE RAFFERTY THRILLER. That’s a subtle but appropriate change. A Hallinan novel is always character driven and The Hot Countries is full of characters you will recognize and ones you will hope to avoid for a lifetime. Bangkok as a character is still there to be appreciated but she’s been pushed off, exit stage left, into a wing to play a supporting role. As this novel notes expats are drawn to the hot countries and this expat tale could have been written successfully with any number of them serving as the backdrop because the writing and story are what hold your interest. Some characters are too good to kill off and others are so good you need to bring them back from the dead. So it is with Treasure, a 13 year old girl psychologically damaged from the abuse of her nightmarish father Murphy, and Wallace an elderly and forgetful veteran, (Wallace first appeared in the short story Hansum Man found in the 2011 anthology Bangkok Noir). Wallace remembers a Bangkok that has long ago disappeared. He once served time in Leavenworth for desertion and now longs to recreate the memories of bar girl love which deserted him. The meeting place for these expats is called the Expat Bar. It is at this bar that Hallinan gives us some of his best writing which leaves the reader pondering some of life’s great questions: how should someone spend a life? How much would you do for those you love? How much would you do to save the lives of people you hardly know? How bad can a bad man be? I particularly liked the visual and the words that went with an interrogation room with a drain meant to be noticed and the usefulness of chicken blood. The Hot Countries is the third in an informal trilogy starting with The Fear Artist, where the focus is more on Poke going it alone as a fugitive with the help of his Thai Royal Police friend, Arthit and the follow-up For The Dead, which focuses more on Poke’s family, wife Rose and adopted child Miaow. Mia, as she is known to her school mates, is an aspiring actress, also 13 years old and is put center stage in more ways than one. This is a novel with more suspense and familial moments than thrills as Poke does what he does best, protect what has made him whole, his family, from the worst men that war societies have created. Treasure becomes a desired pawn in a power play of greed and evil on one end and love and generosity on the other. Miaow, being the same age as Treasure becomes the conduit of both desires showing her hard earned wisdom achieved from knowing what it is like to be abandoned and then wanted at an early age. Miaow teaches Treasure that finding people who love you is only part of the equation in life’s journey, “You have to say yes. You have to let them love you.” Hallinan pays homage to all the right people, places and things in The Hot Countries, including his fellow authors, Christopher G. Moore in Chapter 1 and Dean Barrett in the Afterward. After seven novels in this series, Tim Hallinan still possesses that ability most coveted by published authors: he makes you want to turn the page. If you are looking for a great Bangkok Thriller then I highly recommend the fourth in the series The Queen of Patpong by Timothy Hallinan. If you want to read a very good novel that happens to have a lot of aging expats in it, no matter what demographic category you may be in, even if you’ve never been to Thailand, then read The Hot Countries published by SoHo Crime. Whether you are on a beach in Rio De Janeiro, waiting for winter to end in Calgary, Canada or expecting a child in Azusa, California The Hot Countries will make you think about life and what it takes to create one. Thanks, Gary. Give Hallinan a go if you haven’t yet. He’s very good. One of my favorite writers has done it again! His Poke Rafferty series has mystery, suspense, travel, love, laughter and tears.